Should cost analysis takes a different approach to price discovery. With should cost analysis the buyer attempts to understand the underlying labor and material cost drivers to simulate the expected price. This "should cost" becomes the baseline reference point used to negotiate final pricing. Car buying provides an example. A strategic car buyer goes from dealer to dealer using prior price quotes to negotiate until finally no dealer will go lower. 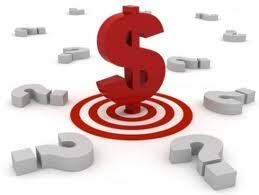 A should cost car buyer looks up the dealer invoice and negotiates a mark up based on the dealers cost. Should cost analysis is the most important cost reduction technique used by top tier OEMs, but it isn't for everyone and you may be better served with traditional strategic sourcing. To figure out whether should costing is right for you, start by understanding the benefits and shortcomings of strategic sourcing. 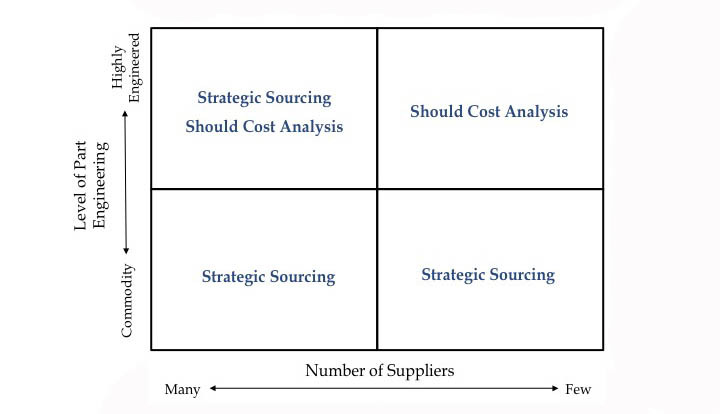 Basic strategic sourcing is the simple comparison of price quotations. More advanced strategic sourcing involves gathering total spend data and using this to drive negotiations. Simple to say, but in practice this can become quite complex at mid-sized or larger companies. For example, do you know your total spend for PCBAs? Does total spend include your division, or a combination of all divisions in your company? Very often large companies will total the spend for all divisions, have corporate negotiate prices, and then tell divisions who they must buy from. Strategic sourcing has been quite successful for a very long time. The logic of strategic sourcing is largely responsible for driving manufacturing out of the US and into lower cost regions around the world. Relying on supplier competition to discover the best price is most appropriate when the product and the suppliers are very similar. When procuring office supplies you are buying very similar products from very similar office supply companies, and strategic sourcing is a very good approach. Strategic sourcing starts to break down when the products or services being procured are asymmetrical. In a simple example, using price quotations alone to compare suppliers with significantly different quality and delivery performance won't lead to successful outcomes. In the case of printed circuit board assemblies, produced by contract manufacturers that vary widely with regard to capabilities, performance, quality, and geography, price quotations alone are simply incapable of discovering the best total value. In this situation should cost analysis is the best in class method of driving value. Launching should cost analysis for PCBAs begins with understanding the materials and labor required. Since your company designed the product your engineering team can provide the bill of materials and assembly drawings. Based on your bill of materials you can determine the material cost, and then use the placement data to estimate labor. Estimating labor rates at a contract manufacturer involves understanding the "burdened labor rate", which includes direct labor and overhead. It is very difficult to learn the true burdened labor rate, but various surveys and analysis' have established $40 per hour as a reasonable expectation in the US. The next question is how much time the PCBA requires for assembly. PCBA specifications may require SMT placement of many different component sizes. At what rate can the supplier place those components? How much does it cost the supplier to set up the SMT line? What inspection methods (SPI, AOI, AXI, etc.) are being applied? At this point a serious should costing effort requires access to objective 3rd party data regarding labor times and costs. We suggest Charlie Barnhart & Associates data. For the moment, you could assume .03 cents per SMT placement and .12 per through hole placement. So if your assembly has 300 SMT placements, assume 300 X .03 = $9.00 labor cost. In addition corporate overhead costs must be applied, which typically add about 2-3%. The final should cost element is the profit margin charged by the supplier. In the United States for relationships of $5 million and less the average profit margin is 25%. If materials are $100, a should cost roll up would be $100 (materials) + $9 (burdened labor) + $2.18 (2% corp costs) = 111.18 / .75 (25% margin)=$148.24 should cost. This kind of should cost information can be invaluable when conducting price discovery with asymmetrical suppliers. Few high quality contract manufacturers will be persuaded to lower prices based on competition from a low quality competitor. But any decent contract manufacturer will be very willing to enter into an honest conversation about true costs and how to drive them lower. The real power of should costing is realized when OEMs move beyond analysis and take actual control of material. Top tier OEMs do not send out requests for quotations, except perhaps to investigate cost models at potential new suppliers. They negotiate component contracts themselves and inform the contract manufacturer of the negotiated price and vendor. More and more OEMs adopt this model each month, and we believe it will be the dominate approach within the next 5 years. Should costing is not for everyone or everything. Often strategic sourcing is the most effective and efficient method of discovering the best price. But for electronic contract manufacturing, should cost analysis is a valuable tool proven by the world's best OEMs to uncover the best possible value for your spend. Every OEM with a significant PCBA spend should invest in developing a should cost process to achieve best in class value from its supply chain.